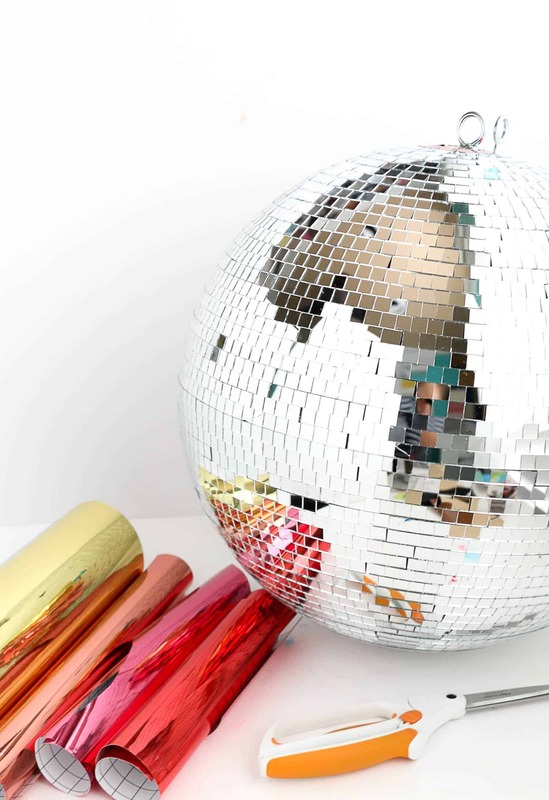 Make Your Own Rainbow Disco Ball! Until I, Kara, bought my first disco ball, I never realized how much sheer joy they can bring to a room. That cascade of bright dancing lights when the sun hits is pure magic. So much so, that now I am now under the impression that everyone is in need of a disco ball in their home! Sure, you can have a plain silver disco ball (I have two! 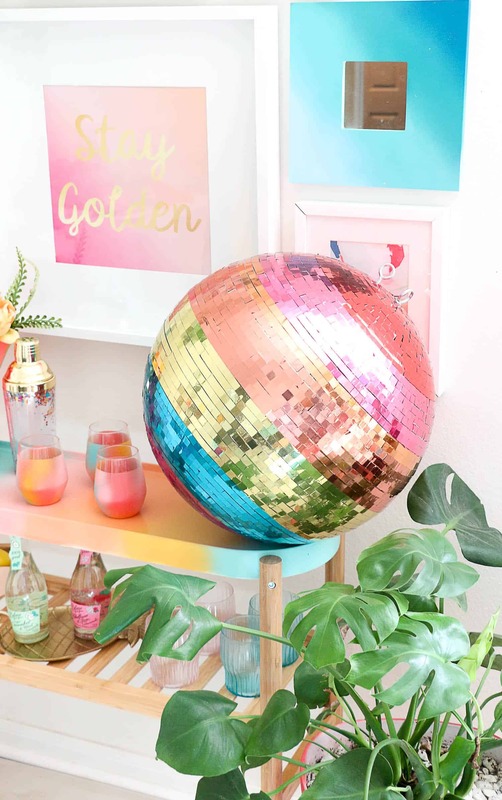 ), but with a little time and DIY prowess you can turn that plain disco ball into a rainbow one that actually reflects colorful balls of light. And look how pretty it is in all its rainbow glory. I will admit that transforming this 16″ disco ball took quite a bit of time (about 15 hours! ), but I think it was totally worth it! However, if you don’t have that amount of time to commit to this project, simply start with a smaller ball for a much quicker project time. 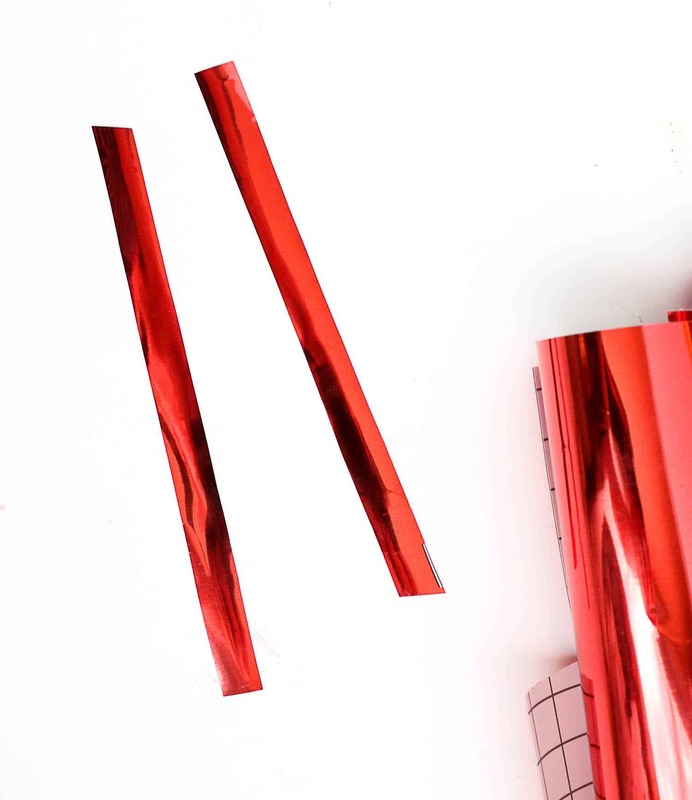 Step One: Begin by cutting 3/8″ strips of vinyl. You can use a rotary cutter and ruler or just freehand it using the grid on the back of the vinyl as a guide. Step Two: Remove one of the vinyl pieces from the backing and cut into squares. Then simply stick the vinyl square over the silver mirror. Step Three: Repeat, repeat, repeat! For my large 16″ disco ball, I used one full sheet of each color plus about half of a second sheet for the orange and gold bands. 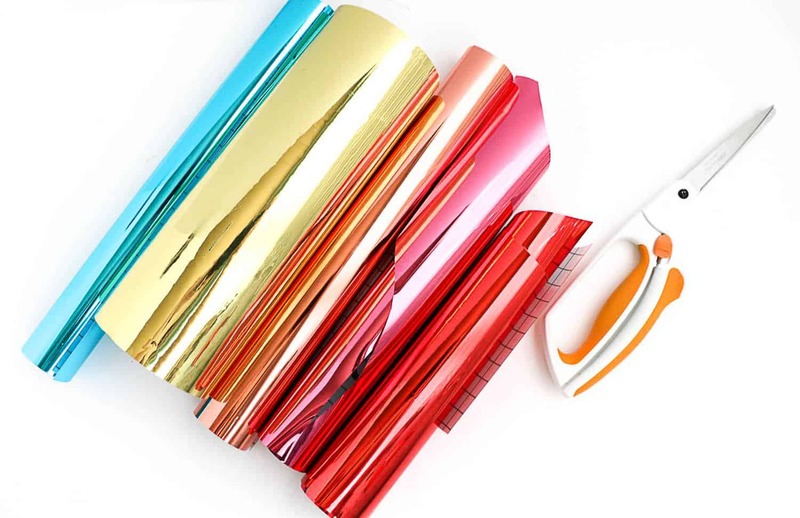 Once you have added all the vinyl, your disco ball is done and ready to shine a rainbow all over your home. Now for a few helpful hints when undertaking this project. For the middle bands, you can actually just add the intact strips over the mirrors and then come back with an X-acto knife to cut the squares. This makes the process so much quicker, but only really works for the two middle colors as those are less curved and will allow the vinyl to sit flush on the mirrors without bubbling up. And second, if you are looking to cut down on time even more and have access to a vinyl cutter, you can have your vinyl cutter cut out the square shapes and then just add them to the ball like stickers. This has got to be the prettiest disco ball I’ve seen. 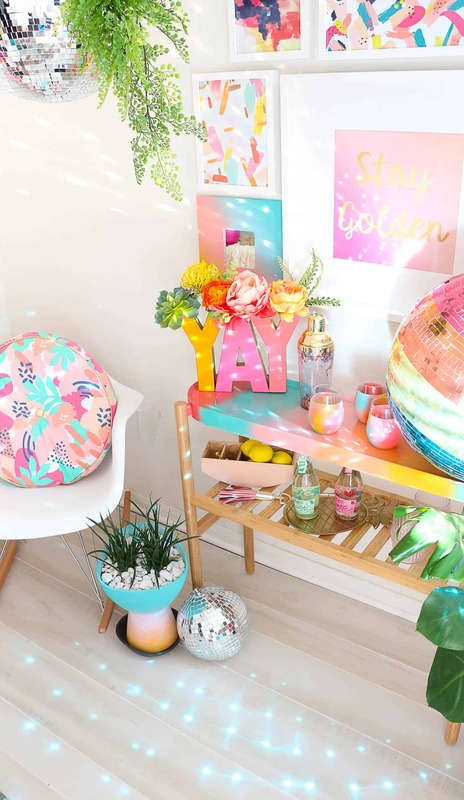 Love the pastel rainbow colours, so playful! This is sooo cool and so much better than a usual disco ball! This looks like so much fun! In fact, the whole styling of the first photo looks so bright and gorgeous! Thank yo so much for disco ball. Will be a great fun. This definitely updates the disco ball look! I bet the kids would love this craft, and it would occupy them for awhile :-), so cute! Oh my god, how pretty!!! I am so into this! 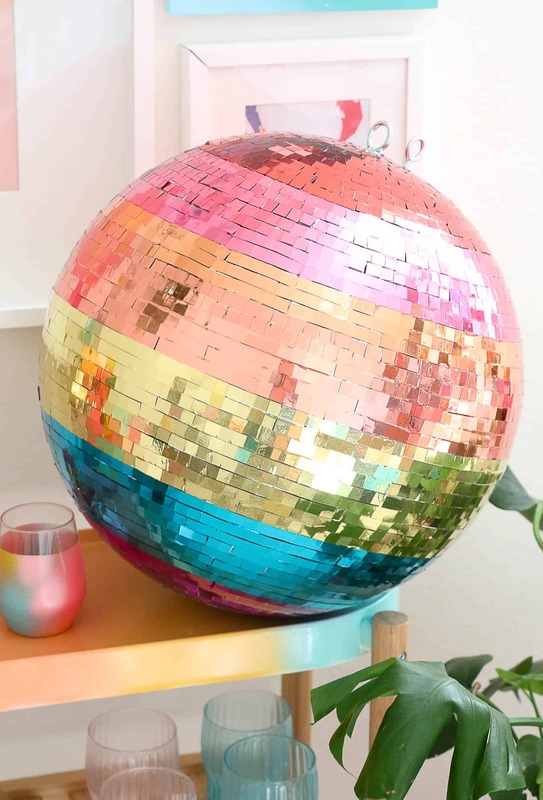 I love a good dance party and have always wanted my own disco ball- but this takes it to the next level! This is so cute! You did an amazing job! The colors make the discoball so beautiful and lively! I was hoping to see a picture of the light that bounces off of it. Is it colorful like the colors? I tried to capture a good photo of it, but it was difficult. The second photo from the top shows a bit of the lights on the ground. But yes, it reflects the colors in the balls of light. Absolutely love this!! Thank you for the inspiration. I have a gold glitter ball which I love. But this is amazing!! I am going to make one for my holiday home in Brighton! It’s meant to be!!! What a fabulous idea! 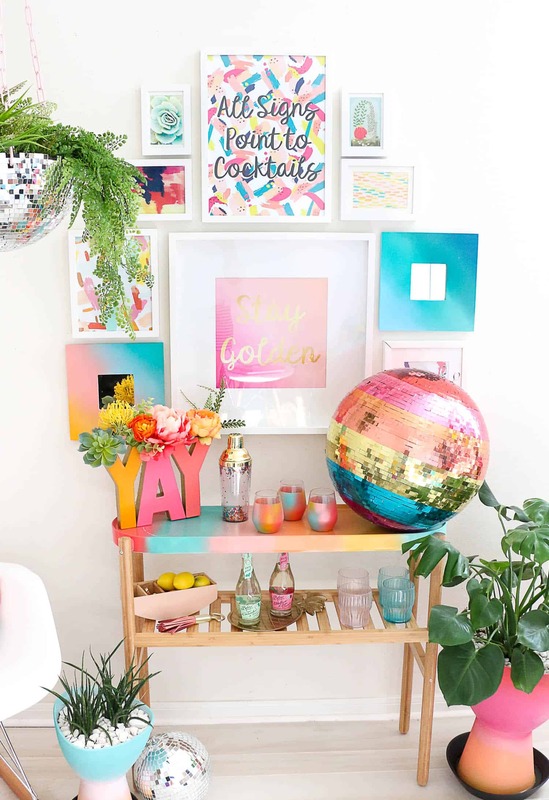 Loving the whole bar area too – soft pretty rainbow sherbet! Gorgeous! You’re not alone; I have a disco ball in the bedroom and know the magic of sunny dots dancing around in the room. Makes me smile everytime. ? 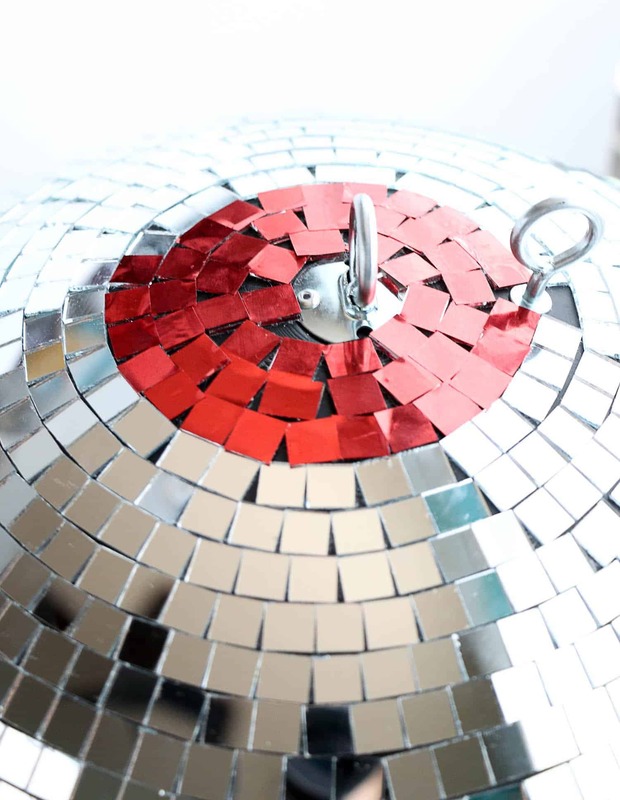 Amazing disco ball, in our home parties it will be the best and prettiest ball, thanks for sharing this amazing idea. This is FANTASTIC!!!!! Love it! I almost never comment on here although I check in daily to this site and all the projects are great. But I just HAD to on this one! Augh, I love it SO much! SO MUCH! Thanks so much Chelsea! So happy you love it!!! Thank You for sharing this..It was really very useful and worth reading!!! What a great idea. I just realized I could use translucent glass paint instead of cutting all the vinyl. Thanks! So glad I found you on Pinterest. I’m going to go follow you on Insta now too! Can’t wait to see your other posts!!! Thanks and keep it up!! !